The Ford F-Series is the best-selling pickup in the USA. One of the reasons for its popularity is the wide range of body and powertrain variants for personal use and utility needs. 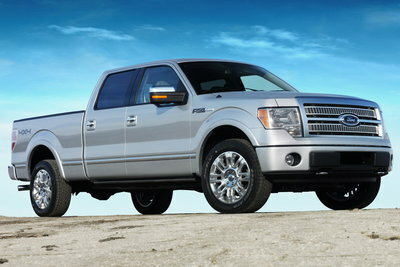 The 2009 Ford F-Series features all-new styling and a new frame that is both lighter and stronger. The range includes three V8 engines; a 2-valve 4.6L V8, a 3-valve 4.6L V8 and the range topping 5.4L V8. Some applications feature a six-speed automatic, the rest retain a four-speed automatic. Recent Ford innovations such as the tailgate step, capless fuel filler system, and the SYNC voice activation system all find their way to Ford's flagship vehicle. The F-Series retains its flexibility with a dizzying array of 35 different model choices in three cab styles, two bed styles, three bed lengths, and seven trim levels including a new Platinum edition.